*Bruce Willis starred in the 1989 movie Look Who's Talking as the voice of baby "Mikey." Walter Bruce Willis was born in 1955 in West Germany to his German mother, Marlene, and his American GI father, David Willis. The family settled in David's hometown of Penns Grove, New Jersey in 1957, and the couple has three other children. After Willis came onto the radar screen in 1985 with his role as David Addison in the hot TV show Moonlighting, the actor would occasionally discuss his past struggles with stuttering in both print and television interviews. In the 1997 book, Bruce Willis: The Unauthorized Biography, by British author John Parker, Willis is quoted as saying, "I could hardly talk. It took me three minutes to complete a sentence. It was crushing for anyone who wanted to express themselves, who wanted to be heard and couldn't. It was frightening. Yet, when I became another character, in a play, I lost the stutter. It was phenomenal." Parker also writes that Willis had a definite formula to conquer his stuttering by implementing a series of confidence building exercises encouraged by a school speech therapist. 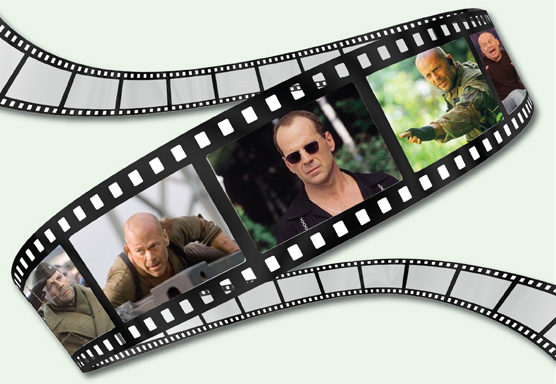 According to a 2001 biography, Bruce Willis: Overcoming Adversity, by Sandy Asirvatham, Willis admitted that at times he was reluctant to discuss his childhood in probing interviews because it was too painful and a large part of the pain was due to his stuttering. In high school, Willis became the class cut-up, which eventually lead to getting involved in drama. Becoming the class joker was his way of trying to fit in. In fact, Anthony Rastelli, a high school teacher vividly remembers Willis' struggles and first attempts to speak before an audience. Rastelli is quoted in Parker's book as saying, 'At an age when most boys were finding their feet, Willis had a hard time. The stammer was a problem and in the end he began to compensate for it by his antics. He had to establish himself among the pack, and, unable to do so with fluent speech, he did it another way ' making himself stand out in the crowd by becoming the joker, the mini-tearaway. What he was doing was saying "Yes, I stutter ' but doesn't mean I'm not good as the rest of you, better even.' I nearly died for him when he went on stage to make a speech. The kids were all laughing but somehow, he stuck it out and finished his piece, which was fairly typical of his spirit. And eventually, of course, he discovered that in front of an audience, he could overcome his disability." Willis achieved the image that he strived for by first cutting-up in class and then becoming one of his high school's drama stars. Willis later told an interviewer, "A big part of my sense of humor came out of my stuttering, in trying to overcome that and have some dignity. I said, Yes, I stutter, but I can make you laugh." However, Willis left high school with no definite decision to become an actor. As a stuttering youth with poor grades and a family that could not fund a college education, Willis hung around town and saved his money. After a couple of years, Willis enrolled at Montclair State College in New Jersey which had a noted drama program. It was there that drama professor, Jerry Rockwood, was impressed by Willis and encouraged him to see a speech therapist - making the combination of acting and speech therapy the undergrad's ticket to both fluency and future success. Willis' spectacular acting career exploded from Moonlighting to Hollywood's A-list, and to box office smashes - The Sixth Sense, Armageddon, Bonfire of the Vanities and the Die Hard franchise of movies. Willis ranks as the 7th highest-grossing actor in terms of leading roles. Willis' struggle with stuttering is inspirational. Unfortunately, it is rarely mentioned in interviews. However, by identifying himself as a person who stutters, Willis has an opportunity to put a human face on the daily struggle stuttering often presents.